» Easter Week was blessedly quiet after a busy but successful Triduum. Our liturgies seemed to have a highjer attendance than in recent years. » Last Sunday Abbot Geoffrey and the Abbot President went to Downside to conduct a canonical visitation of that monastic community. They returned to Douai on Wednesday. » Yesterday the EBC History Symposium held its annual meeting at Douai. The non-monastic delegates outnumbered the monastic ones. » In a 19th century Miscellany, a sort of scrapbook, from our former mission at Chipping Sodbury has been discovered an engraving of our chapel in Douai soon after its completion. 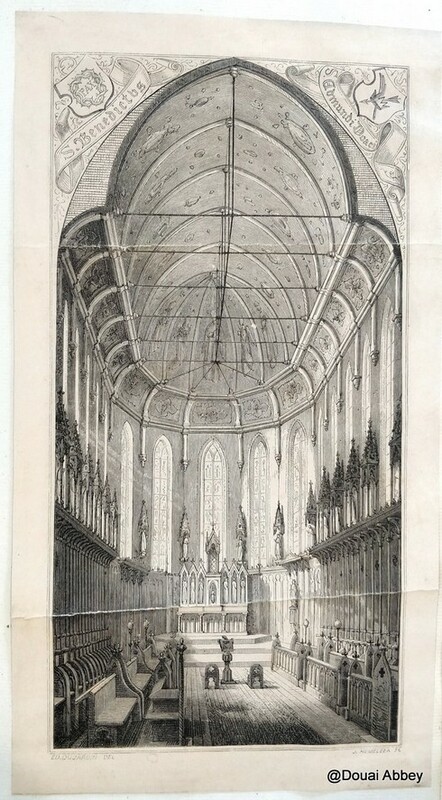 Dating from around 1848, and executed by Dujardin, it shows the clean lines of the Pugin design. The cantors' stools in the centre of the nave made it here to Woolhampton when we were forced to leave Douai in 1903.